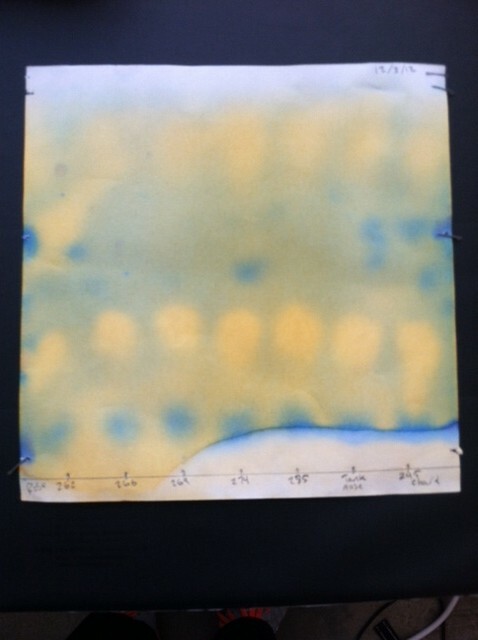 Until recently, malolactic fermentation in wine has been viewed as a capricious, uncontrollable event due to a lack of understanding of the process. This was problematic as MLF is a pivotal process in wine making- either improving or destroying the final product. With better knowledge of the process today, MLF is understood as the conversion of L-malo acids to L-lacto acids during secondary fermentation through the presence of certain strains of bacteria. This conversion is linked to mouthfeel, acidity, and the aroma of the wine. It is important to monitor for MLF as bottling a wine before the process is complete will be detrimental to the wine. There are different ways to monitor MLF; Donkey and Goat prefers using chromatography paper to determine when this process is complete. A detailed example of this process can be found at http://www.youtube.com/watch?v=FyegXP6G9r4. 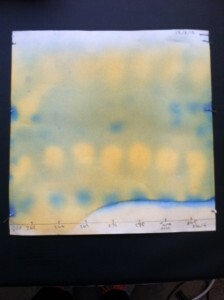 Example of chromatography MLF test of our Rose. As always with Donkey and Goat, we allow the process of MLF to occur naturally rather than tamper with additives to induce or complete the MLF process. Because we buy aged barrels and reuse them, we have plenty of Lactobacillus (a bacteria that assists the MLF process) already present in our barrels, which allows us to avoid inoculation. However, this is not always the case with our wines: one of our wines (our Brosseau Vineyard Chardonnay) does not complete and rarely starts MLF. As you probably already suspect, we do not kill the wine with SO2 and we do not filter. The pH on the wine is in the 3.1-3.2 range which is a natural prohibitor of MLF and we’ve never had a problems with bottle fermentation and been making this wine since 2003.